A disgruntled former employee shot and killed an ex-coworker outside the Empire State Building before being shot dead by cops, who sources said wounded nine bystanders as police bullets sprayed across the crowded street during Friday’s morning rush. 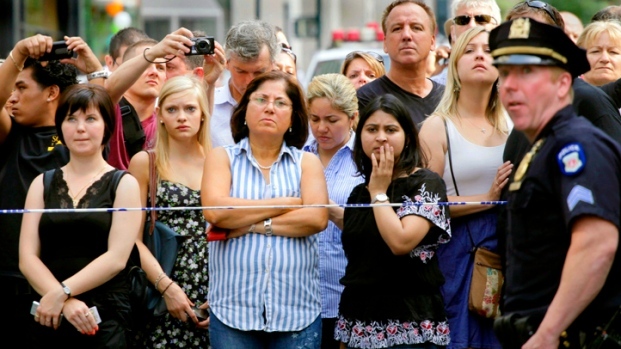 Most of the injuries to bystanders were minor, Mayor Bloomberg said. 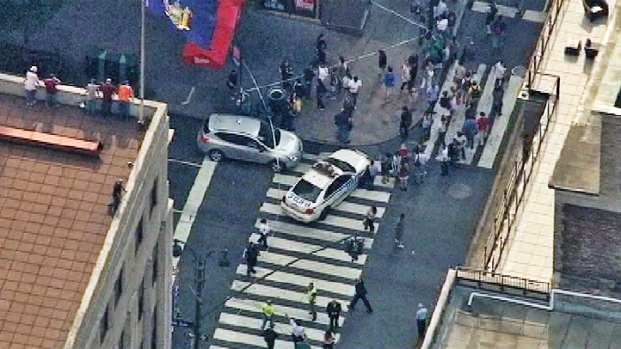 The shootings, in front of one of New York City's most iconic landmarks, created chaos and gridlock at a time of day when the streets were jammed with tourists, commuters heading into their offices and merchants opening their shops. 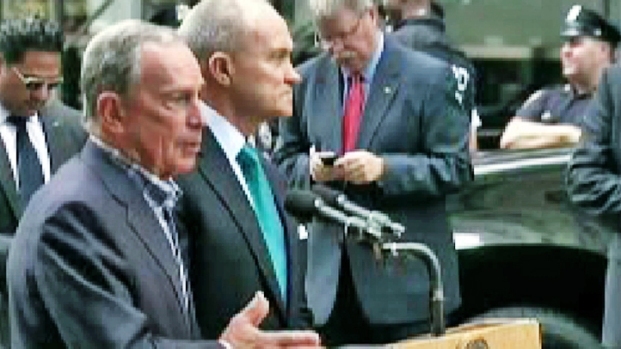 Police Commissioner Ray Kelly describes the details of the shootout that erupted outside the Empire State Building Friday morning as Mayor Bloomberg offers condolences to the family and friends of the 41-year-old coworker who was shot. Chilling surveillance video released by police shows people packed on the sidewalk -- some seated on a bench, some walking -- suddenly running in terror as the gunman and the police officers confront one another. "People were yelling 'Get down! Get down! 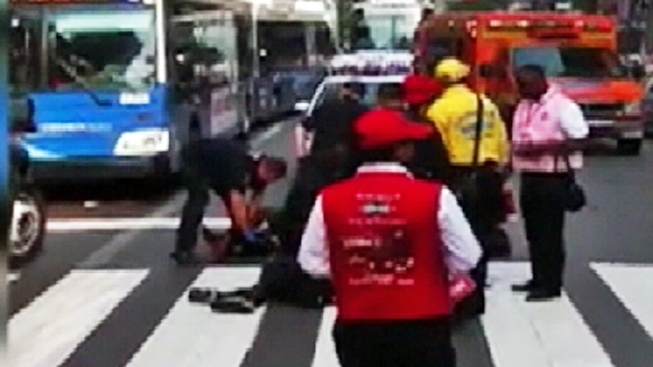 ", said Marc Engel, an accountant who was on a bus in the area when he heard the shots. "It took about 15 seconds, a lot of 'pop, pop, pop, pop, one shot after the other." Police Commissioner Ray Kelly identified the shooter as Jeffrey Johnson, 58, of the Upper East Side, who was laid off last year from his job at Hazan Imports, a women's accessories company at 10 W. 33rd St.
Johnson apparently returned there Friday morning and shot and killed Steven Ercolino, 41, a coworker, Kelly said. Johnson and Ercolino had filed police reports against each other in the past year. According to the police report filed by Ercolino, Johnson allegedly confronted him in an elevator at Hazan Imports last April and threatened to kill him. On Friday, sources said, Johnson made good on that threat, pushing Ercolino to the ground, standing over him and firing. Ercolino was shot five times, sources said. Johnson then fled north on 33rd Street with his .45-caliber handgun hidden in a black bag under his arm, Kelly said. A construction worker who followed him alerted uniformed cops on a counterterrorism post. As the two officers approached Johnson, he pointed his gun at them and they shot at him, firing at least 14 times, Kelly said. Kelly said the officers had "a gun right in their face" and "responded quickly, and they responded appropriately." Listen to NYPD radio transmission as the chaotic shooting scene outside the Empire State Building unfolded. "These officers, having looked at the tape myself, had absolutely no choice," he said. It's likely Johnson did not get a chance to fire. The surveillance video shows Johnson dropping his briefcase, falling to his knees, then collapsing on the ground. Law enforcement sources said Johnson purchased the .45-caliber handgun in Florida in 1991. He was not licensed to carry in New York City. Seven people were taken to Bellevue Hospital and two others to New York-Presbyterian Cornell, the FDNY said. All were from New York City, except a woman who was visiting from North Carolina. The ages of those hurt ranged from 20 to 56. Those hit with police bullets suffered minor ricochet and graze wounds, mostly to the lower extremities, said Paul Browne, an NYPD spokesman. 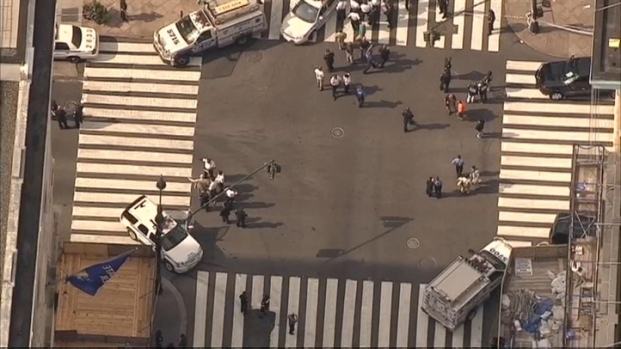 Six of the wounded bystanders were treated and released from the hospital, police said. Three were admitted for other non-life threatening injuries, including elevated blood pressure. Seven people were shot at the observation deck of the Empire State Building, one fatally, before the gunman, a 69-year-old Palestinian teacher, turned the gun on himself. Authorities said emergency personnel received a call about the shooting at Fifth Avenue and 34th Street just after 9 a.m. and that units were on the scene within minutes. The FBI was also on the scene. "We have multiple people shot in front of Empire State Building," an operator said over the police radio Friday morning, according to audio provided by radioreference.com. "We took the perp shot." LISTEN: NYPD Radio Call for Shooting: "Perp Down"
Witnesses described the shooter as a tall man in a gray suit. Kelly said he was dressed in a suit and carrying a briefcase. Nicholas D'Aurizio, a designer who has known Ercolino for around eight years, said Ercolino was "a very hard worker, very work-driven, very aggressive in nature." He had a longtime girlfriend and had recently moved from Manhattan to a riverfront apartment in New Jersey, D'Aurizio said. The body of the gunman remained on the street, under a white sheet, in front of Heartland Brewery until it was taken to the city medical examiner's office around noon. Traffic has returned nearly to normal after roads were closed and detours put in place earlier. Officials at the Empire State Building declined to comment Friday morning, except to say the building remained fully operational. In 1997, a 69-year-old man opened fire on the observation deck of the iconic landmark, killing one person and wounding six before shooting himself in the head. The gunman, Ali Abu Kamal, was taken to the hospital, where he died more than five hours after self-inflicting the fatal wound. Law enforcement officials believe the 1997 attack was premeditated.